A home of more than 250 m2. Located in "your own village street." The house consists of a row of three houses dating back to the 12th century. The complex is entirely up to the edge c. q. "Outside" of the village. A beautiful view therefore, the green rolling hills of the Molise region. Down in the garden (accessible by stairs from the house) your pool is waiting for you. With a fine, covered and shaded "loggia" with sofas and an outdoor fireplace. 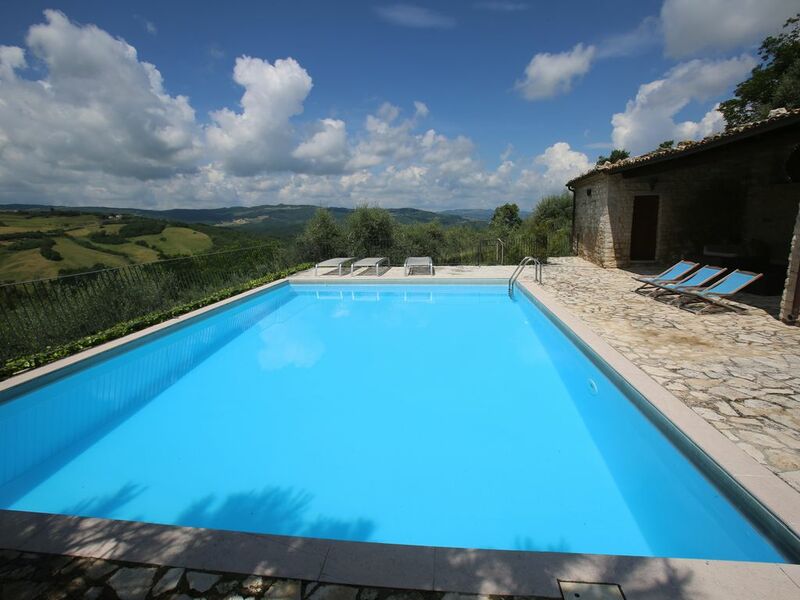 From this spot you have stunning views over rolling hills with forests and fields. A higher level is a large outside terrace with large dining table under ancient trees. What a place! There is also a table tennis table in the house for guests' use. From the house and the edge of the village are the necessities within walking distance (there is also a nice restaurant in the village, across Molise you really amazing Italian food !!). On the one hand there is the vibrancy of an authentic Italian village community. On the other hand, denotes the house so very private and quiet. The street itself live only two people, the rest is owned by the Dutch owner. Actually you have the village street so to yourself, really unique. In the garden (more than 6. 000 m2), which is located on the south face of nut trees, figs, plums, apples, and an olive grove. Of course you can pick in season itself. The medieval village Ripabottoni has only 550 inhabitants! Here you experience more real Italy, unspoiled and not spoiled by tourism. Dear helpful Italians, a beautiful region, divine food, slow food. It's like stepping back in time. The sea is about 30 minutes drive. Here in the summer many typical Italian Sunday and zeebedrijvigheid and busy badplaatjes (as Termoli and Vasto). Long sandy beaches and very clean and beautiful sea (most beaches here have the blue flag, which stands for very good and clean sea water). Looking for quiet beaches, there are also (you get many tips from the owner). In the immediate vicinity of the house are also several large lakes for swimming and lounging. The Lower Lande owner has restored the house with great care and attention. Beautiful old details have remained intact. The house consists of three floors and can accommodate 8 adults (cots can be added). On the lower floor is the spacious, luxury kitchen with all modern conveniences. Cooking enthusiasts come here their money's worth o a.. A professional Italian coffee machine with separate koffiebonenmaler, large refrigerator with freezer, ice maker, dishwasher, 5 burner stove, microwave oven, coffee maker, etc. etc.). On the first and second floor there are four double (double) bedrooms, three are en suite. The whole house has WIFI, air conditioning and there is satellite TV (NL and IT). It is possible the adjacent apartment and studio hire with the house. The property is suitable for 14 people. Ideal for a vacation with multiple families or a holiday with a large family. If desired, also much be arranged on request, from catering to tours in the region with a guide. Excursions such as cooking workshops, oil and wine tasting, cultural excursions etc. are organized by the Dutch owner. There all kinds of excursions are also organized to better learn the Molise region, such as wine and oil tasting, jeep safaris, cooking workshops, visits to local producers, cultural trips etc. In consultation can also be a program.